Finds kids whose parents “sucked” their child’s pacifier were less likely to develop asthma, eczema and food allergies when compared to kids whose parents avoided the “nasty” cleaning method. “We demonstrate that a common parental practice, sucking on the infant’s pacifier before it is given back to the infant, is associated with protection against early eczema development and asthma symptoms,” wrote the researchers, led by Dr. Bill Hesselmar, a pediatric allergist at the University of Gothenburg in Sweden. The Study consisted of 184 Swedish infants. 80% of the children had a parent who already had allergic reactions. Babies were tested for allergies at ages 18 months and 3 years old. Parents kept diaries for the 1st 12 months, including illnesses & medications. 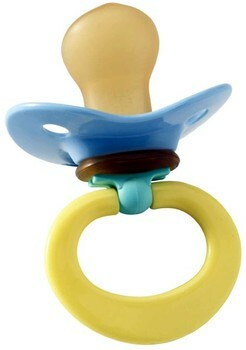 75% of babies studied had used a pacifier in the first six months. Many parents rinsed the pacifier in regular water, but nearly half boiled it and one third of them “sucked” the pacifier clean. The researchers also noted the effect against asthma and eczema with vaginal deliveries versus cesarean-section. This leads us to more questions about our “cleaning” practices. Is cleaning too much, to much for our kids, do they need more exposure to germs to have their immune systems grow? From a conservative healthcare family, we believe “germs” helps us grow our immune systems and that exposure to colds, flu, chicken pox are all building blocks for our immune systems to play with and learn. You as a reader didn’t learn to read by listening to streaming audio, why do you think a germ free environment is helping to build your immune system ?